Of the diverse variety of Indian garments that exist, the saree is undoubtedly the most renowned. The beautiful 9 yards of fabric has been around for ages and is far from waning in popularity. In fact, the love for the elegant garment only keeps growing. The majestic saree is also a Bollywood favourite so to celebrate Independence Day, here’s a roundup of 8 stunning B-town stars who stylishly donned the saree with pride. For an awards ceremony, Deepika Padukone chose a pink and gold saree with a gold choker necklace, classic smokey eyes and a neat bun. At a wedding function, Priyanka Chopra stunned in a gold saree with red borders and a green blouse, burgundy necklace and matching lips. Kangana Ranaut had all eyes on her when she wore a burgundy and green Sabyasachi saree with matching jewellery, juttis and Sabyasachi’s signature beauty look. Aishwarya Rai looked nothing short of magnificent in a grey and pink saree by Masaba Gupta, with gold jewellery, sleek tresses and a bright pout. In a dreamy mix of pink and silver, Alia Bhatt paired her Manish Malhotra sareewith heavy earrings and a radiant makeup look. Of course we couldn’t miss out on Bollywood legend Rekha who shimmered in a gold and pink saree with gold jewellery and her signature red lipstick. Saree lover Vidya Balan looked lovely in a pink, orange and gold number with a green blouse which she accessorized with gold earrings and a potli bag. Rounding off our list is Taapsee Pannu who wore a brightly hued Neeta Lulla saree with a black blouse for the right kind of contrast. 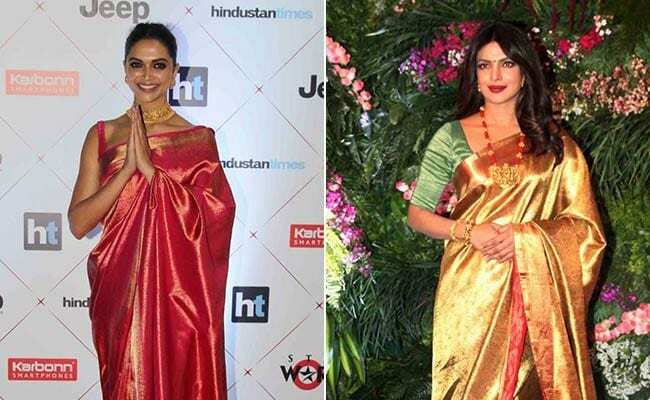 Which of these celebrity saree looks is your favourite one? Let us know in the comments.